It’s difficult to know what Apple are up to sometimes, isn’t it? Is it all a cunning plan whose finer details will only become clear to us mere mortals in the fullness of time, or is the reality as haphazard as it seems? Yes, that’s right. Apple’s cheapest desktop taking second place beneath the top-of-the-range iMac and two places above the iMac Pro, whose price tag is around six times that of its diminutive sibling. 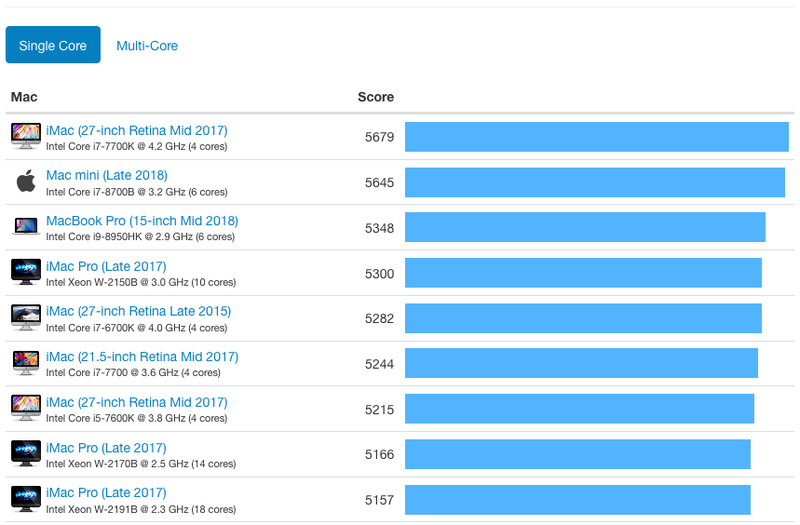 Even in multi-core performance the Mac mini is in the top six, with its paltry six cores coming in just below the 12-core Mac Pro. Even if you upgrade the flash drive to 512GB, this top model still comes in at less than a 933MHz Power Mac G4 in 2002! Then consider the fact that the RAM is user-upgradable (admittedly that’s not a job for the feint-hearted, but at least it is possible) to 64GB and it actually has a reasonably sensible selection of ports (USB 3.0 Type A, Gigabit Ethernet, HDMI, 4 x Thunderbolt 3), and you must be starting to wonder where the catch is? Well we haven’t found one yet and, amongst our clientele, the new Mac mini is already by far the most popular machine to come out of Apple, probably for a decade. So if you’re sitting there wondering if Apple will ever release a new Mac Pro, maybe it’s time to, well… think different?